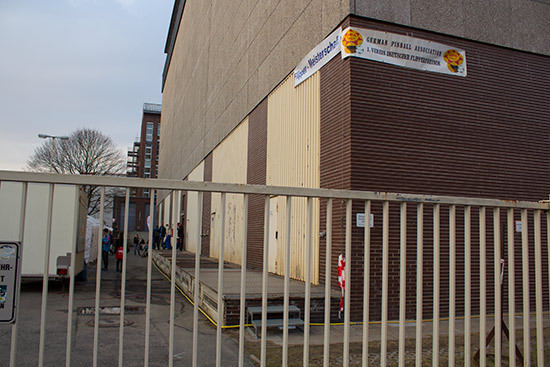 Location: Waghäuseler Straße 16, 10715 Berlin, Germany. 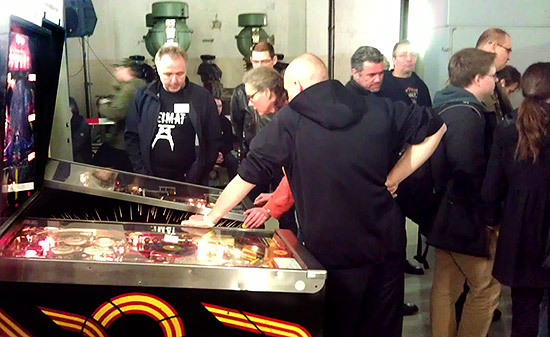 We're here in Berlin for the German Pinball Open which began at 9am on Friday 12th April. 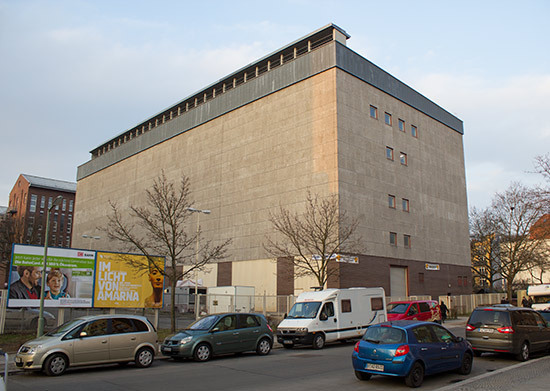 The location is a rather nondescript building to the west of the city, making it around a ten minute taxi ride from Berlin's Tegel airport. 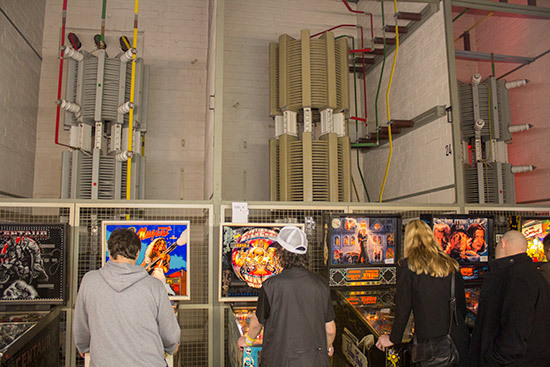 The building used to be a power plant and is now used to illustrate how electricity is converted to different voltages and a city's power grid is managed, giving the German Pinball Open a very industrial look. 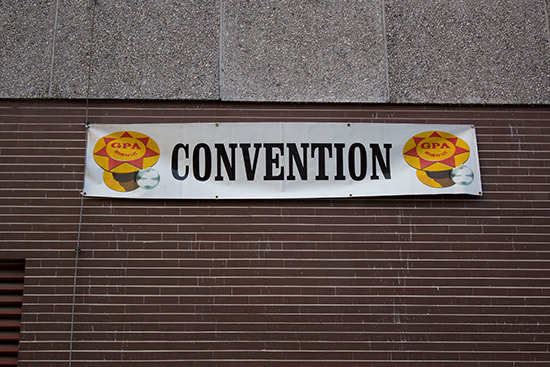 Entry to the GPO costs €5 per day, but on Friday visitors could enter the main tournament for a €10 fee which included show entry. 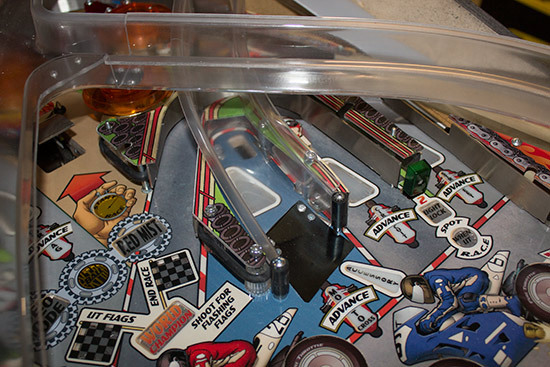 The pinball machines were split between two areas. On the ground floor were the tournament games, while the free play machines and vendors were located up on the fifth floor - a brisk 95 steps up a somewhat institutional staircase. 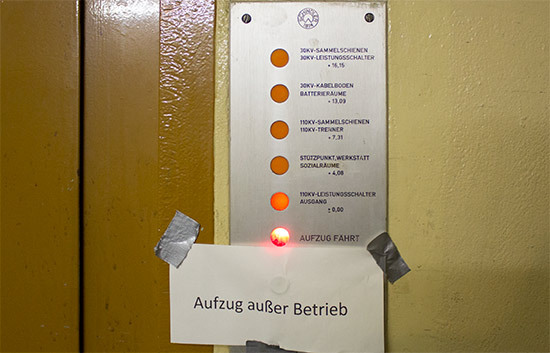 There was a lift but it was deemed unsafe and couldn't be used (at least, not officially). 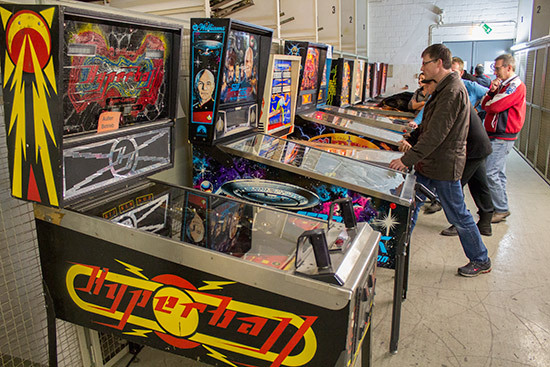 On the day the GPO opened, the main tournament and classic tournament machines were still being set up and were out of bounds. 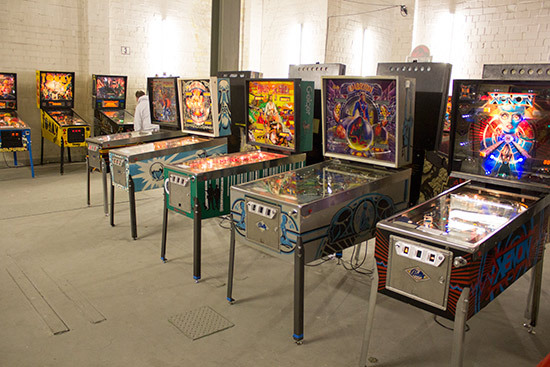 In fact the only machines which could be played on the ground floor were the four used for the pre-qualifying round of the main tournament. 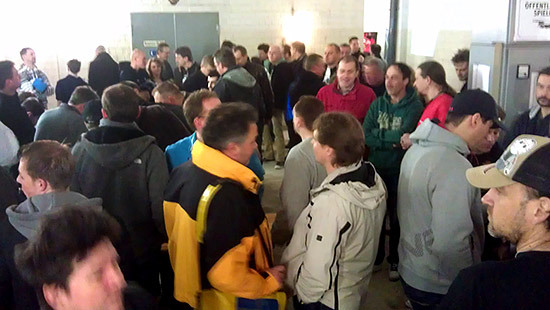 A total of 96 players had pre-registered for the GPO's main tournament. 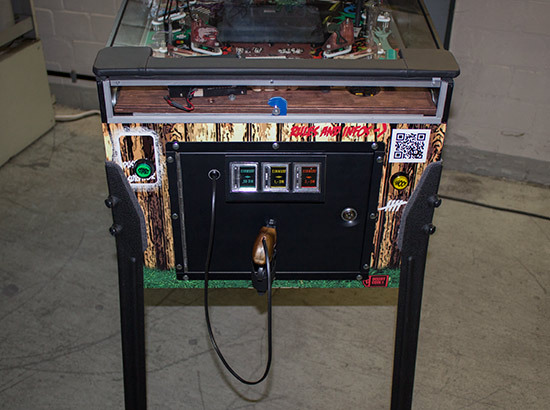 After those sold out very quickly, wannabe competitors had to enter a pre-qualifying round played on Flash Gordon, Terminator 2, The Addams Family and Big Buck Hunter Pro. 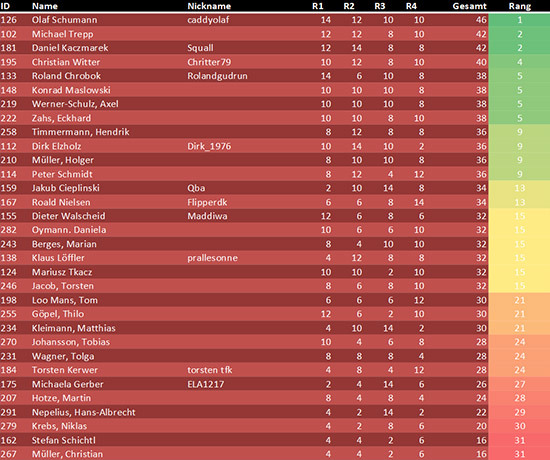 The top 96 players from this round would join the 96 pre-registered in Saturday's main qualifying round. At one point it looked as though fewer than 96 pre-qualifiers were going to compete on Friday, allowing everyone who entered to take part in Saturday's rounds. 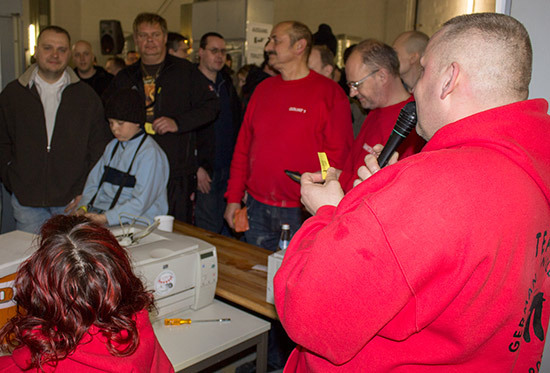 However, by the end there were nearly 120 competitors, from which the top 96 qualified. Most of Friday's action took place up on the fifth floor. 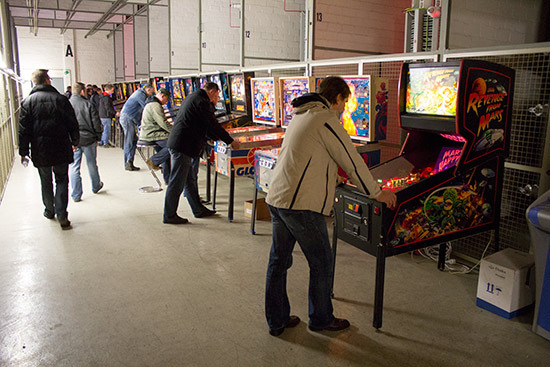 At the entrance to the room was German Pinball Association bar and souvenir stand. 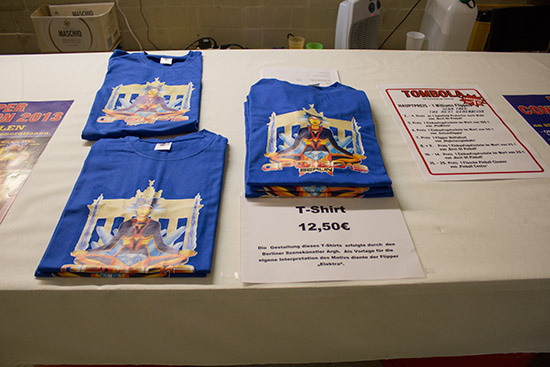 The GPA desk sold show T-shirts for €12.50 and tickets for the raffle for €1 each. 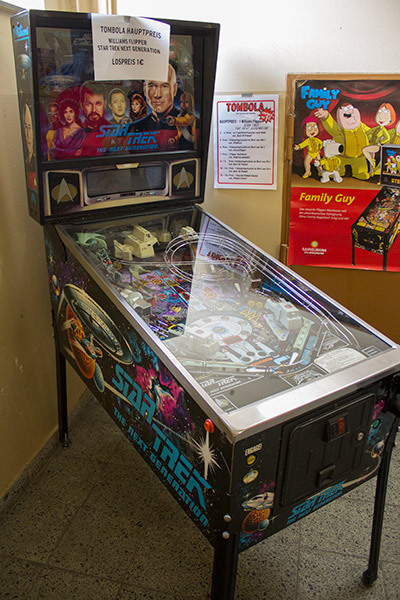 The top prize in the raffle was a Star Trek - The Next Generation machine, which was set up in the lobby at the top of the stairs. 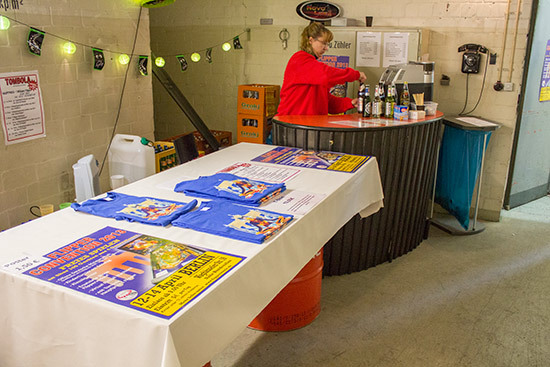 The desk also sold different varieties of beer. Becks - regular, Lemon, Ice or alcohol-free - cost €1.50 ($2) for a 330ml bottle, while Erdinger - Weissbier or Kristall - was €2 ($2.68) for 500ml. 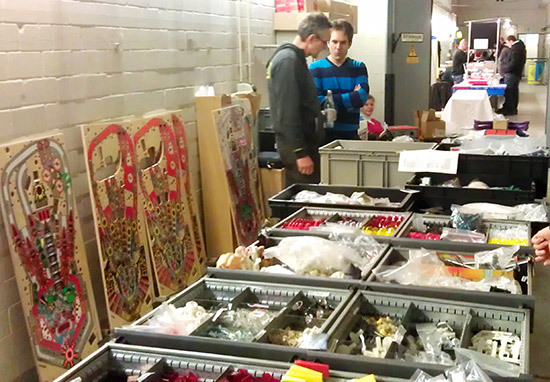 A little further inside the room, there were two parts sellers set up on Friday - The Pin Witch and Gelsen Flipper. 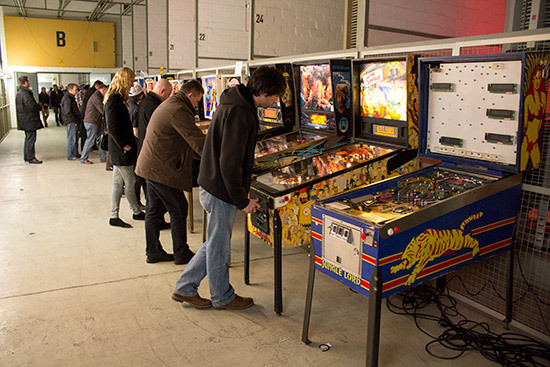 By Saturday they had been joined by High Class Pinballs who were there selling their usual wide selection of pinball parts and playfields. 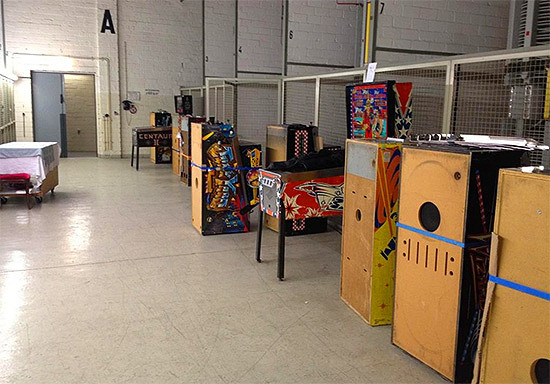 The free play machines were set up in a couple of rooms, positioned in front of various displays of electrical devices. One downside of using such a large building is the difficulty keeping it warm. 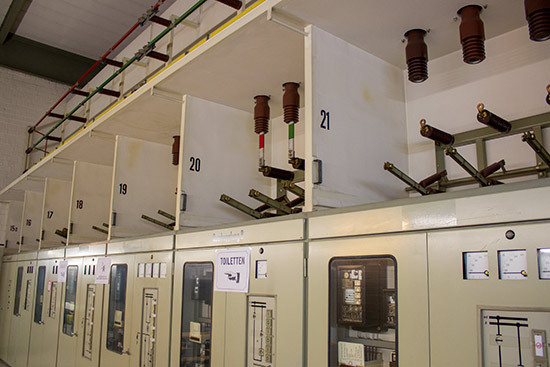 Although the temperature outside wasn't exactly cold, the inside was decidedly chilly, and so industrial hot air heaters were positioned at key points and most people kept their coats on throughout. 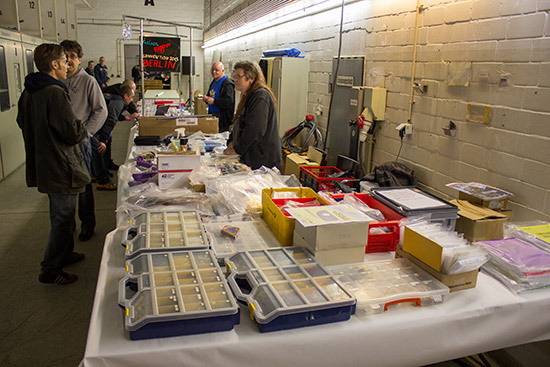 At the end of the row with the parts vendors, some rather rarer machines were set up. 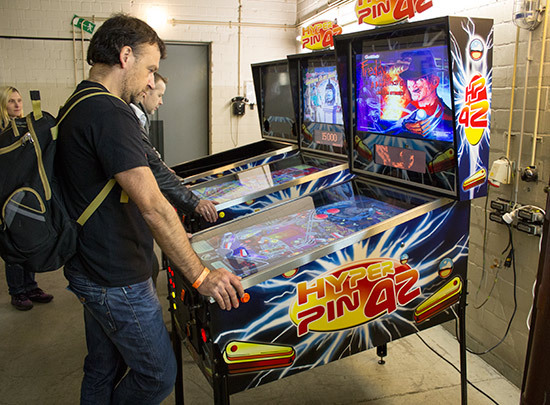 Two Future Pinball-based Hyper Pin 42 video pinball machines were available to play, plus there was a cabinet there to show what is inside one and how the machine is constructed. 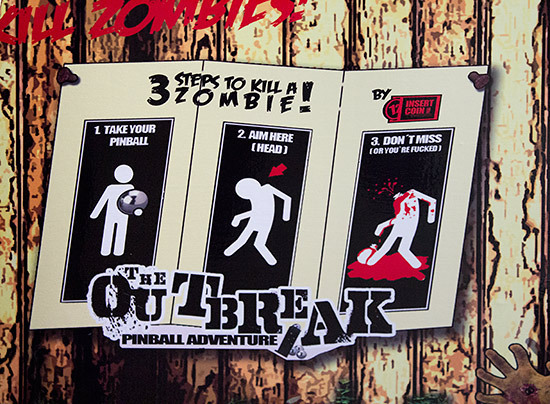 Next to the Hyper Pins was the custom game The Outbreak. 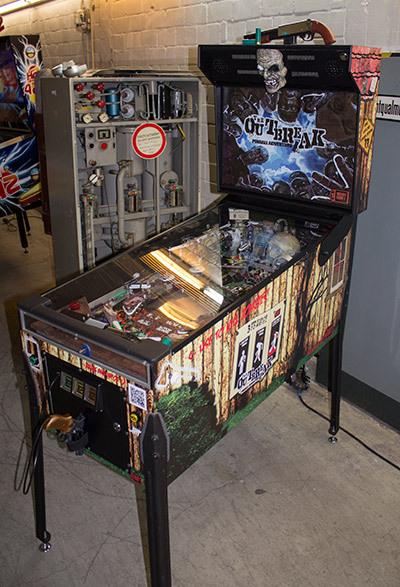 The construction of the zombie-themed The Outbreak had been documented on one of the German pinball forums, Flippermarkt.de. 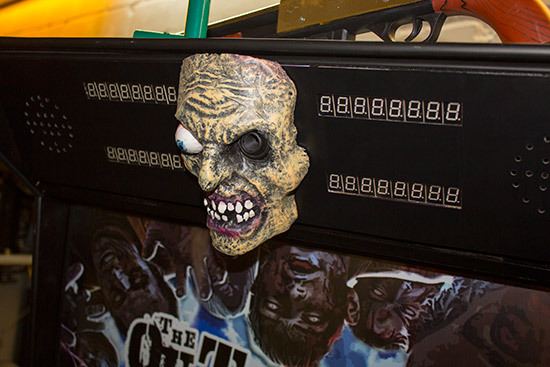 The game contains some unique features, including a light gun mounted on the coin door which is used to shoot at the backbox-mounted zombie head. 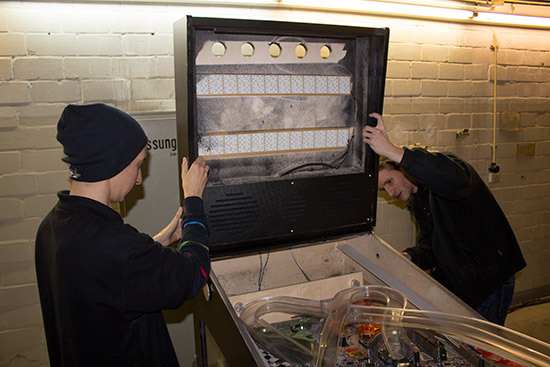 The control boards are mounted in the backbox. 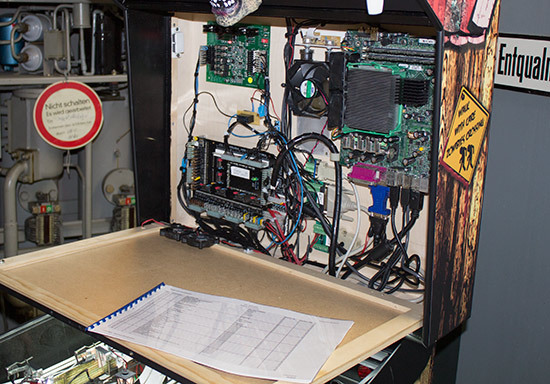 A microATX PC motherboard is the main controller, driving a PINterface pinball driver board with a PinLED power board. 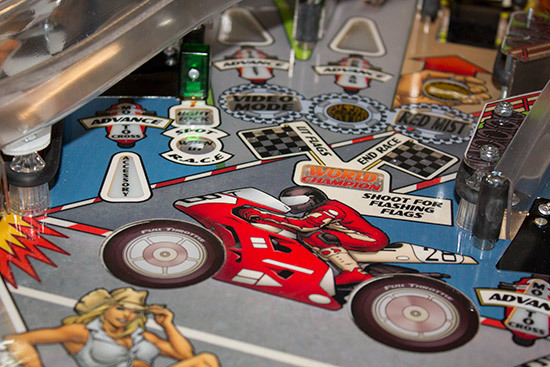 The playfield incorporates an LCD panel and features a rotating gun on the apron to shoot the ball at playfield features. 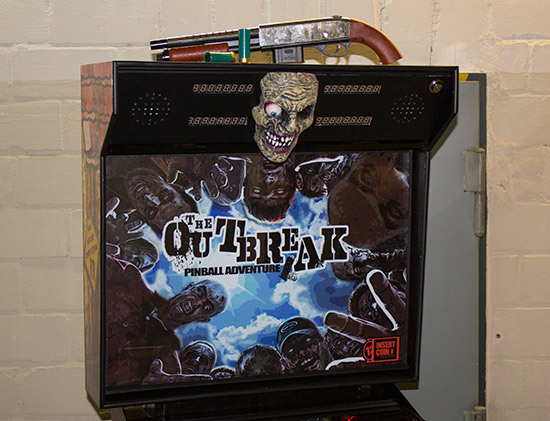 The Outbreak was conceived as a one-off custom game, but there is talk there may be a small production run of around a dozen machines. 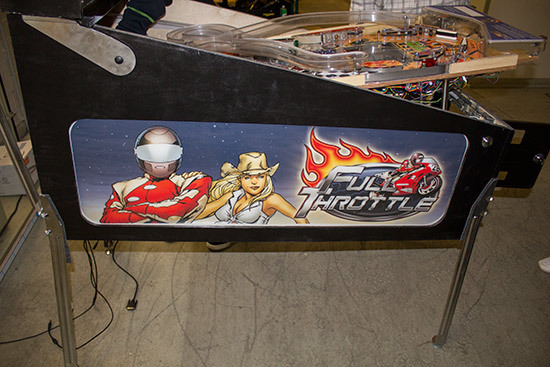 The 2013 German Pinball Open also hosted the first public showing of Heighway Pinball's Full Throttle game. 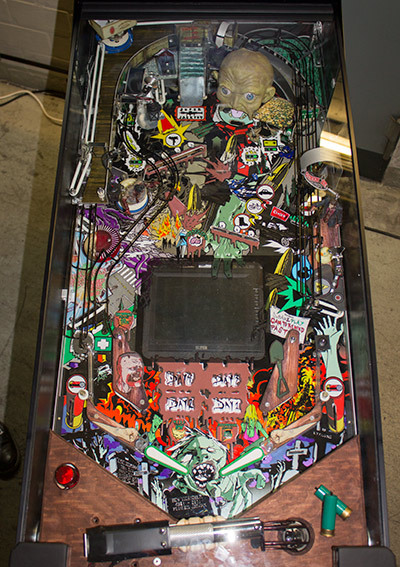 The machine is only a prototype, but it was flipable with some scoring, playfield insert and feature illumination, and the main music track playing. 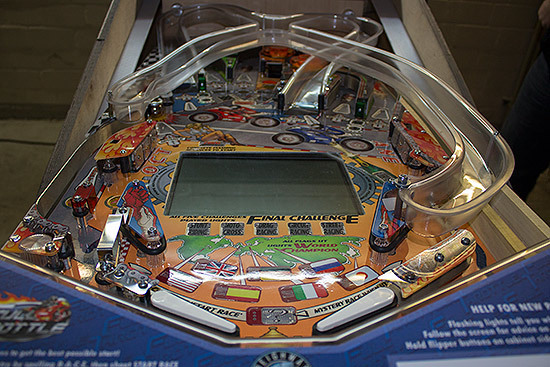 A number of the final game's features were missing, including the pop-up bumpers and the chain drive ball lock mechanism, but the machine allowed players to get a feel for the playfield layout which proved to be very smooth and fast. We'll have more pictures and a unique video of gameplay on Full Throttle a little later. 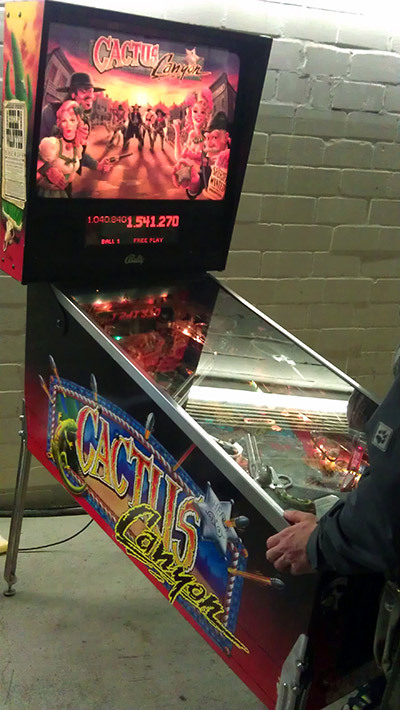 Saturday saw the addition of a Cactus Canyon to the line-up of custom pinballs. This was, of course, running the Cactus Canyon Continued software which adds many new modes and features to the game to make it feel far more complete. 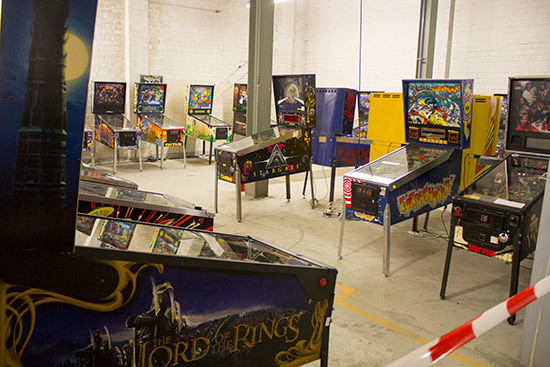 Here's a full list of machines made on Saturday evening. Not all the action happened inside however, as there were a number of facilities along the walkway leading to the building. 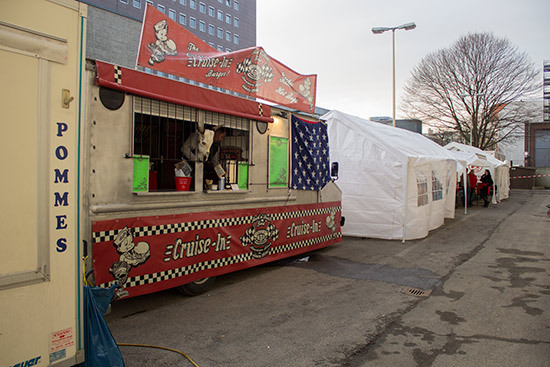 Catering took place outside the entrance, with a couple of food vendors selling staples such as hot dogs, french fries, soft drinks and beer. Food was not allowed inside the building, so there were a couple of dining gazebos set up with tables and chairs. 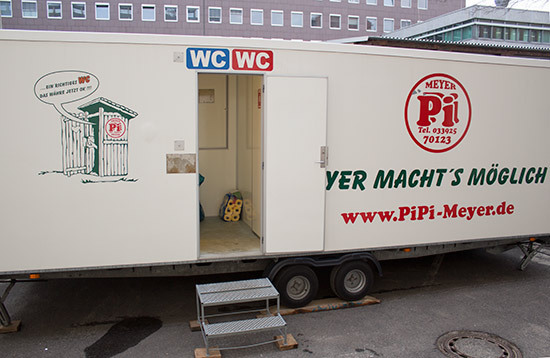 It's worth noting there are no toilet facilities available inside the building, so a mobile toilet block was parked at the far end of the dining area. 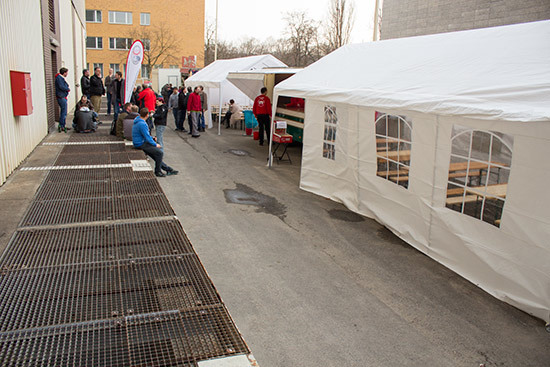 Saturday's action began when the venue opened to the public at 9am. 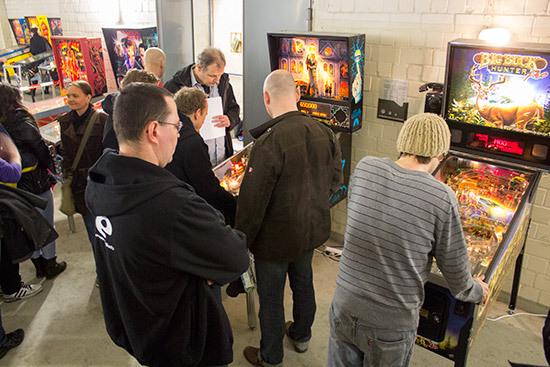 The first round of the main German Pinball Open was scheduled to start at 10am, but getting all 192 competitors together (including the replacements for those who didn't turn up) took another hour. 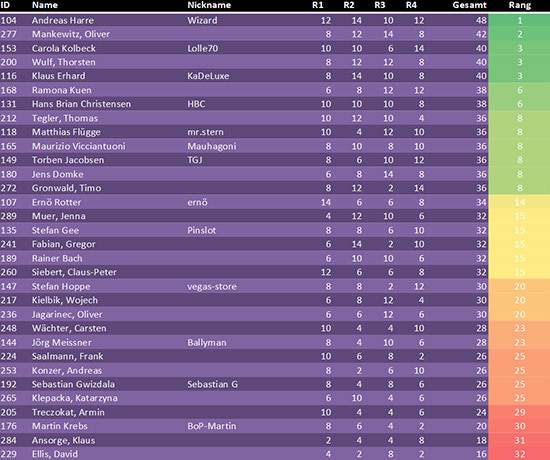 The first round split the 192 competitors into 6 groups of 32. Each group was then sub-divided into 8 colour-coded groups of 4. 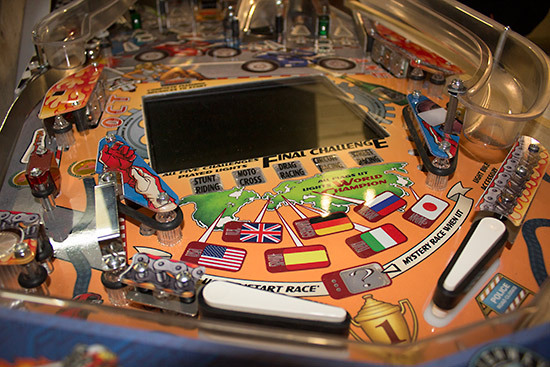 The four group members played each other in 4-player games on two machines. 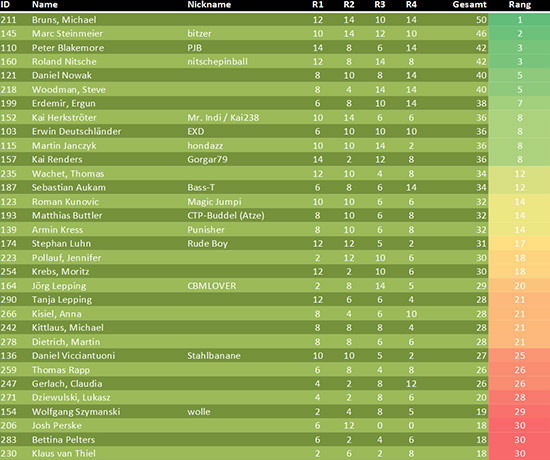 The winner of each game earned 7 points, the second placed player got 5 points, third place score 3 points and last place received just 1 point. 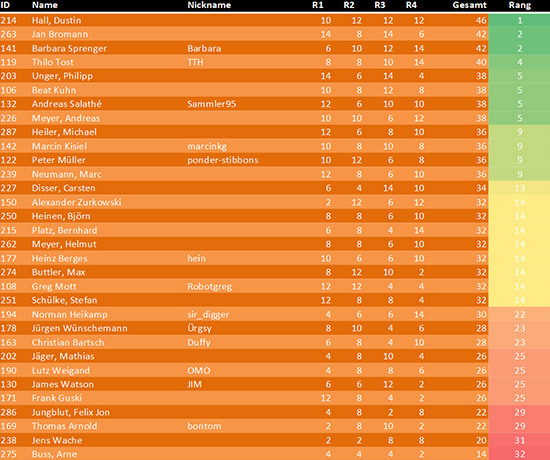 That meant the maximum points available from the two games was 14 points, and the minimum 2 points. This was repeated three more times giving everyone a total of 8 games to play, but the groups were reformed with different players after every two games. 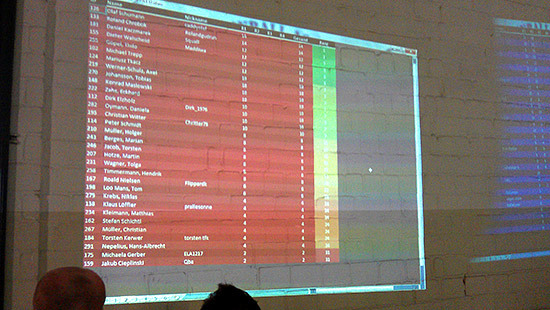 Each player's points total was shown on a pair of computer displays projected on the wall. The projectors weren't the best, with the lamp in the one on the right on its last legs and their position on the main desk inviting people to stand in front of them, but people could usually see the information they needed. 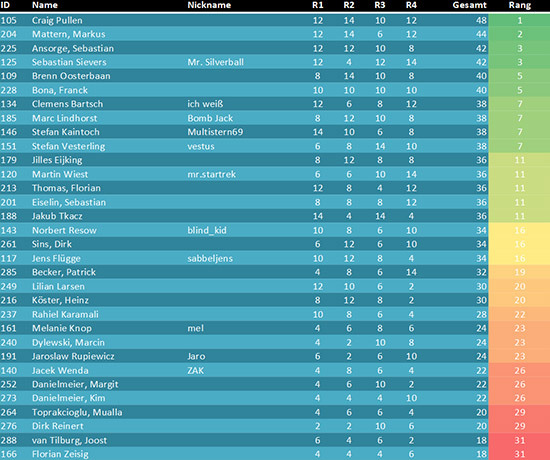 The top 8 from each group gave a total of 48 players in the last round of play-offs before the final. This round used the so-called 'Swiss system' to create 11 head-to-head matches for each player, so that they played against players of similar ability. Anyone who won a head-to-head game would earn 1 point, so after the first set of games, half the players had 1 point and half no points. The second match pitched those who had won against other winners, and those who lost against other losers. 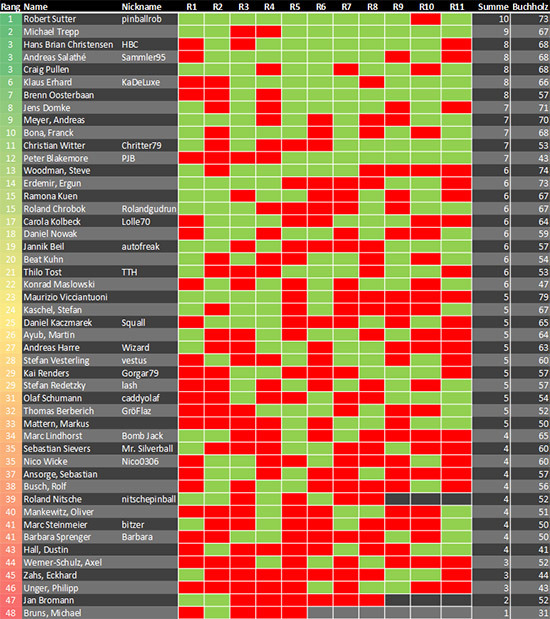 This system of creating matches with players on the same or similar points continued through all 11 matches. 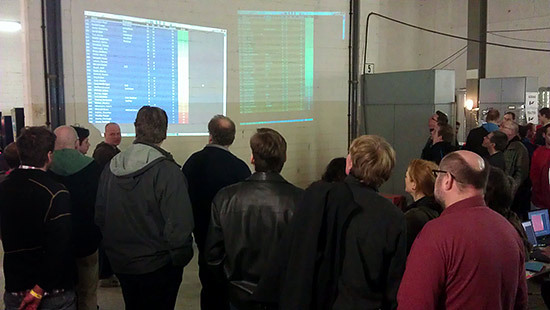 The software also ensured (as far as possible) that nobody played the same player or the same machine more than once. It was intended to play about eight of the eleven rounds on Saturday before the venue closed at 11pm, and continue with the remaining rounds on Sunday morning. However, the games took a shorter time than anticipated and it was just possible to play all eleven rounds on Saturday evening. 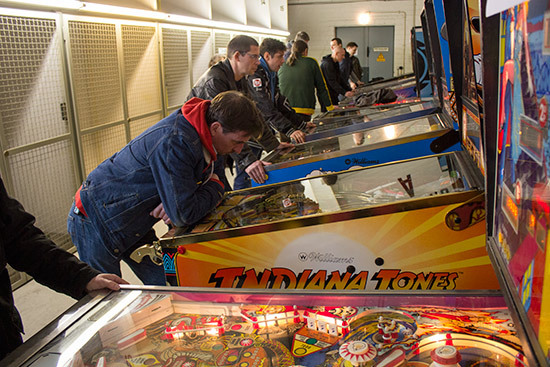 The top four of Robert Sutter and Michael Trepp from Switzerland, Klaus Erhard from Germany and Hans Brian Christensen from Denmark went into the final, which was played on Sunday on three machines; Harlem Globetrotters, Dr. Dude and Theatre of Magic. 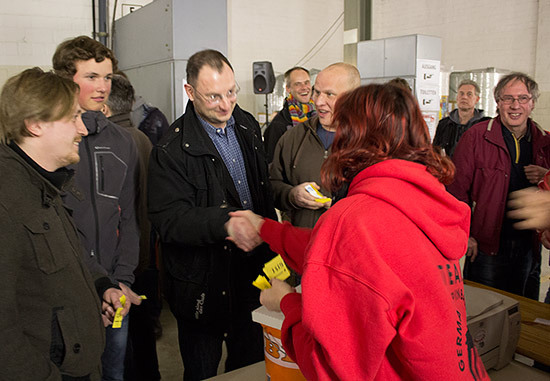 On Saturday evening between rounds of the main GPO tournament, the draw was made for the raffle. The draw for the top prize was made last. The Classic Tournament was also running throughout Saturday, and while many players were kept fully occupied by the main tournament, a good number found time to put in some qualifying games before the session closed at 9:30pm. The finals for this tournament would also take place on Sunday. 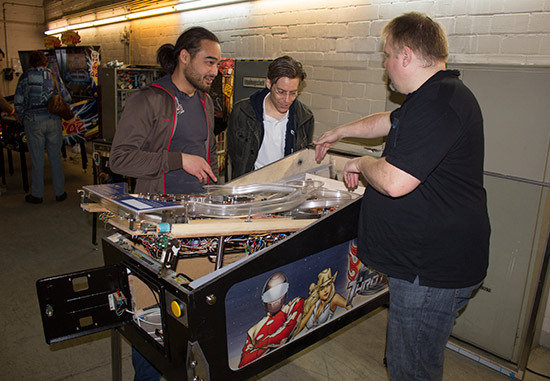 Before Saturday drew to a close though, we grabbed out camera a did our tour of the German Pinball Open in our exclusive Six Minute Tour. Three competitions were to be decided on the Sunday. Firstly the children's competition: this proved to be relatively popular, thanks to reports in the press advertising the event. In total 12 children took part - although to be honest, their parents seemed to have more fun! The final round of the main Tournament took place at 11am. 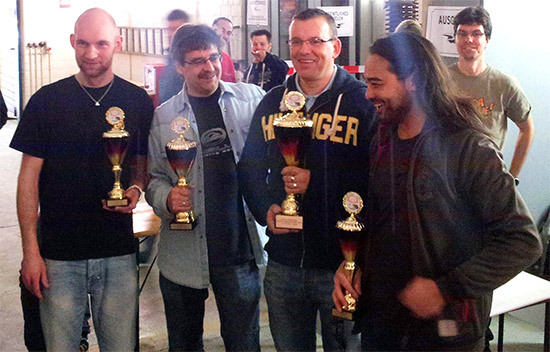 Four players had qualified for the final: Hans Brian Christensen from Denmark, Robert Sutter from Switzerland, Michael Trepp also from Switzerland and Klaus Erhard from Germany. 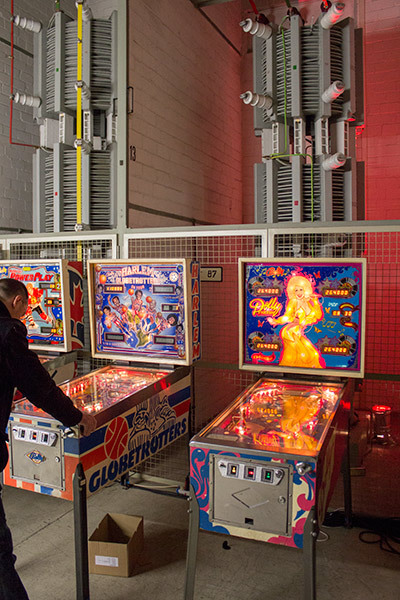 The final was played on three machines: Harlem Globetrotters, Dr. Dude and Theatre of Magic, with the player with the highest score being awarded 4 points, second place 2, third place 1 and the last-placed player 0. First up was the Harlem and Robert Sutter came up with a sensational score almost clocking the machine. Needless to say the first round went to Robert. Next up was Dr. Dude and Klaus Erhard proved he was 'The Dude' with a score that was greater than the sum of all other players combined. Brilliant! The competition was really hotting up and going into the final round on Theatre of Magic any one of the players, apart from Michael Trepp, had a chance of winning the tournament. Sure enough, as fate would have it and with a point to prove, Michael stormed home with a sensational win. 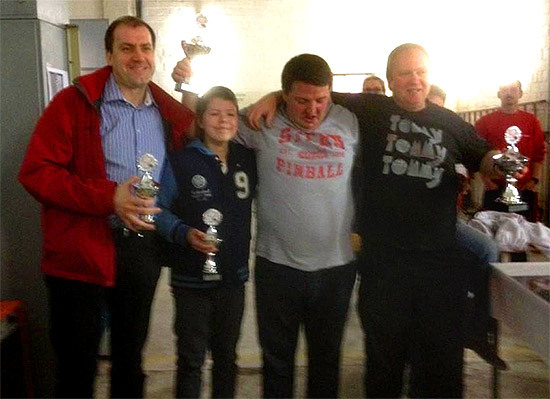 However the results from the first two games prevented him from winning and the honours went in the end to Klaus Erhard, who was crowned the Champion of the German Pinball Open 2013. The last competition of the day was the Classic, which started at 1:30pm. 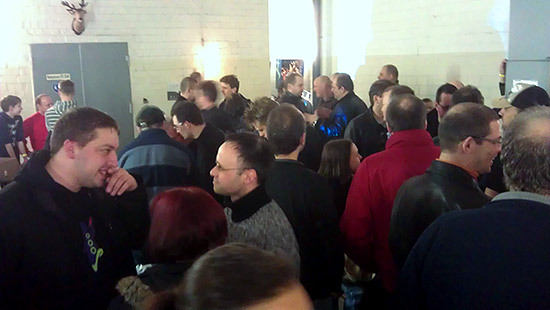 A total of 96 players had bought entry tickets for this event, with the best 32 players making it through to the final. The winner from this group would be decided based on the Double K.O. method. 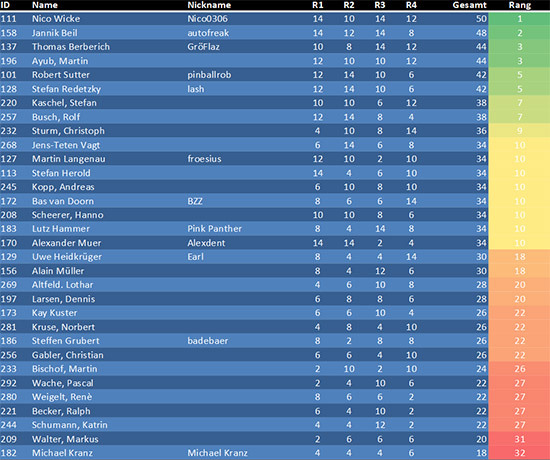 The final was between Andreas Harre (Germany) and Franck Bona (France), with Andreas taking the honours. A special mention also has to go to 13-year-old Clemens Bartsch, who beat Dirk Elzholz to take third place in the Classic event. An excellent achievement for one of our youngest participants. 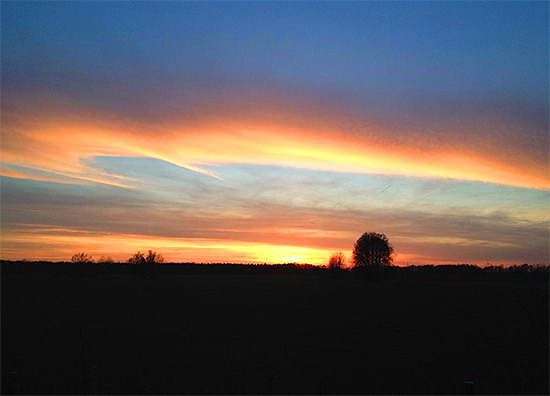 And finally, as if sent from the Gods, on the evening of the tear-down we were honoured with a beautiful sunset as reward for all the hard work, sweat and tears of the weekend.